Things are getting busy at Class Cover HQ so we are on the look out for new full-time recruitment consultants to join the team. Download a full job description or please get in touch with kate@classcover.com for more details. We had an amazing Macmillan coffee morning recently, raising £130! So thankyou again for all those that baked and donated. Good luck Steyning Town Football Club! Class Cover is supporting the Steyning Town Community Football Junior tournament on the weekend of 12-13 May. A weekend of fun and football as well as refreshments available all weekend. Catch all the action on the Shooting Field, Steyning. Good luck to all the teams taking part. 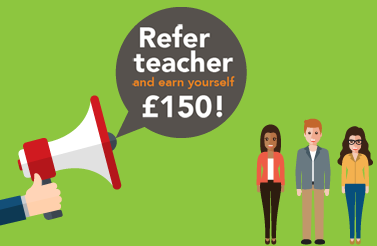 Refer a Teacher you know.